Very nice project, but why You didn’t use USB-enabled AVR like ATmega32u4 or so. Are You going to drive top and bottom heaters independent? I’m thinking about using Your controller in DIY BGA rework station – bottom heater want to set for 180 celsius (for Lead Free solder), and top heater to 230 celsius, of course with recommended profile. What do You think about that? Does Your controller allow me to do that? 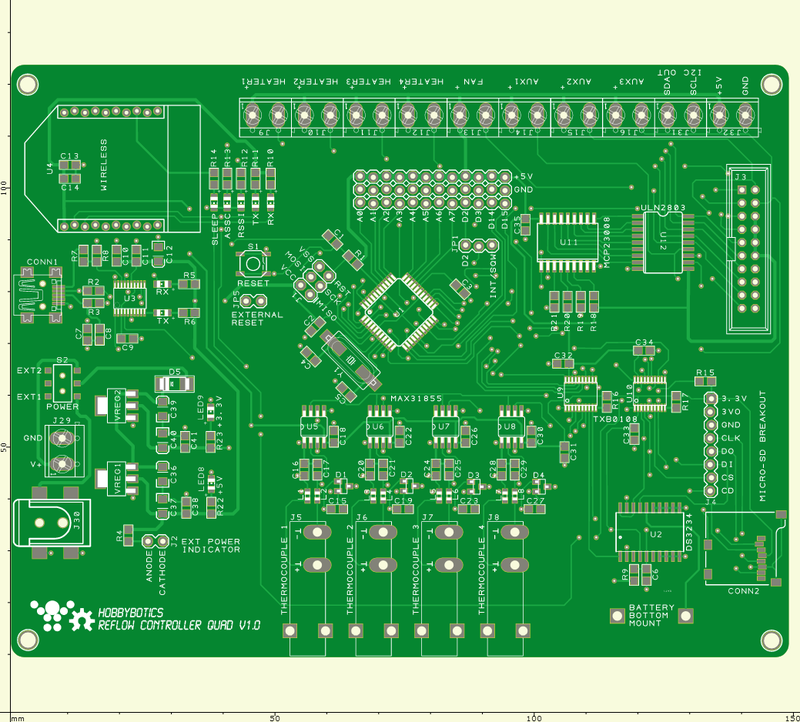 I considered using the ATmega32u4 specifically for the on-board USB but, I wanted something with more user flash memory and SRAM. The ATmega1284P has 4K EEPROM, 16K SRAM, 128K Flash while the ATmega32u4 has 1K EEPROM, 2.5K SRAM, 32K Flash. Also, the FTDI 231x USB chip is much cheaper than the FT232RL. The new design will be able to have independent heater control. Your use case is exactly why I re-designed the controller. There will be 4 MAX31855 thermocouple ICs on board that’ll allow monitoring/control of 4 separate heating elements or ovens. 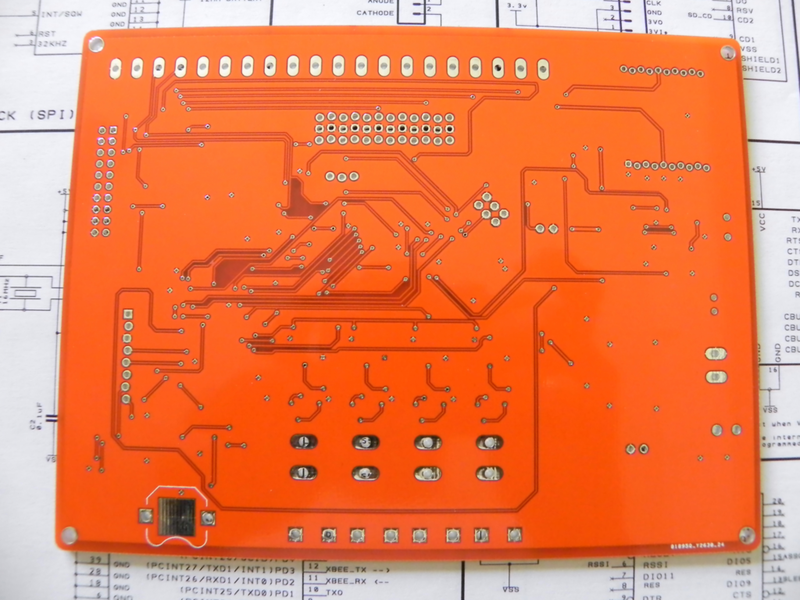 I’m very interested in this as it might make doing double sided boards in a single reflow cycle possible, assuming you’re planning this? It’d be great if you were. Could you add the feature of putting the top two on one SSR and the bottom two on another? So with the fan that’d be 3 SSRs as a minimum dual setup. This would help keep the cost down on SSRs. And use only 2 thermocouples, top and bottom? In any case, really looking forward to a kit. Maybe a 2 and 4 element kit? If you look at the board there are outputs for 4 SSR outputs and additional auxiliary ports. The intent is so you can wire up the controls how you see fit. So, if you want to tie the top section to one SSR and have it tied to one temperature sensor, then you can (the same for the bottom section). The software would be adjusted to that control scheme. In other words, it’s all pretty open to get the most bang for the buck. I’ll be updating the project status later today. I have a prototype built for the interface but, I’m going to tweak the design a bit to make it easier to mount. I would like to purchase a kit when they become available, how do I go about registering my contact info? Also can you recommend a toaster oven for this project as I understand it you want one with a fan. Also can the oven be double tasked for powder coating ? If so will it need a profile for the controller. I’ll post to the blog when they are available. Te easiest way to know when everything is ready is to register to receive updates from the site. Also, any oven should be good to go so long as it is rated for at least 1500 Watts. You can usually find that rating on the oven box. You’ll also need a profile for powder coating. I’ve never done powder coating but, it would be very useful. If you have a profile in mind I can include it in the firmware for the oven. I will pick a oven up and begin begin testing it for powder coating (Harbor Freight coating kit) and figure out the heating profile. There is some large fume discharge when curing powder coating they recommend a mask with carbon filter, I wonder if it will contaminate the oven for SMT work? I would probably dedicate an oven to each but, you might not have any issues so long as you clean up after each use for powder coating. Please let me know how the testing goes for powder coating. 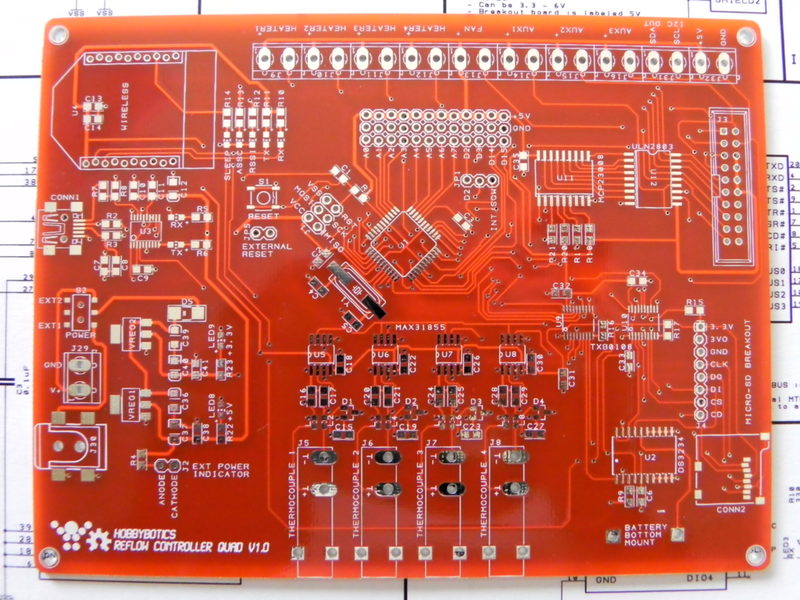 I have Reading the both of the projects about the reflow oven controller and this one looks very interesting. Did you finally completed? Is it posible to get the kit for build one?